You have selected the Band membership membership level. Access for bands and musicians for all Metal Music Bookings website content. Subscriptions to MetalMusicBookings.com provide you with web browser access to all subscriber content on the website of Metal Music Bookings and Management Ltd., herein collectively referred to as "MetalMusicBookings.com". MetalMusicBookings.com will not automatically renew your subscription. If you wish to continue using the service after the end of your subscription term, you will have to re-join. Your Subscription will remain active until the end of the Subscription Term. By registering for an MetalMusicBookings.com Subscription, you agree to be bound to the following terms and conditions, which apply to all versions MetalMusicBookings.com Subscriptions. MetalMusicBookings.com reserves the right to change, update and revise any portion of the MetalMusicBookings.com terms from time to time, at its sole discretion, by posting the most current version of those terms here. If you choose not to accept the changes to the terms, you have the option to cancel your non-refundable MetalMusicBookings.com Subscription. MetalMusicBookings.com reserves the right to alter one or more of these policies at any time, without notice to you. To purchase an MetalMusicBookings.com Subscription, you must be: Legally capable of entering into a binding contract; and At least 18 years of age (or if between 13 and 18 years of age, you must have the consent of a parent or legal guardian). 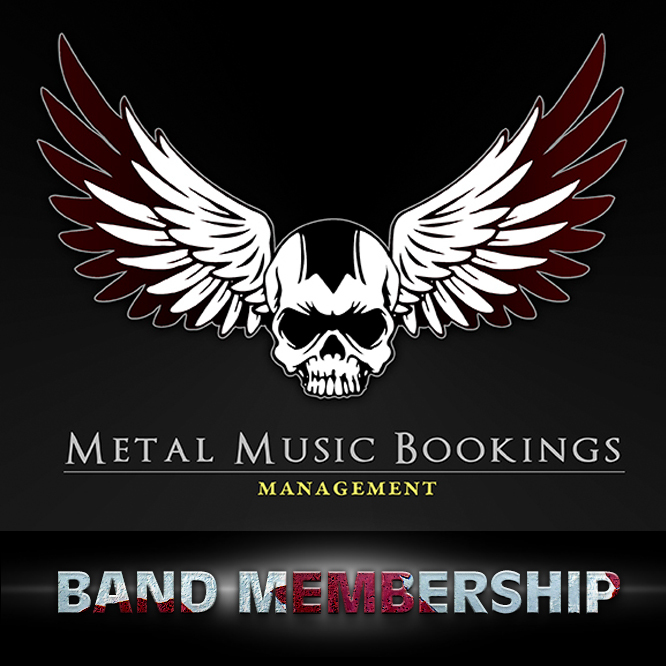 You will be asked to provide valid registration information, a valid payment method, and other payment information at the time you purchase an MetalMusicBookings.com Subscription. The day that you purchase your MetalMusicBookings.com Subscription ("Activation Date") is the first day of your Subscription Term. By purchasing or activating an MetalMusicBookings.com Subscription, you authorise MetalMusicBookings.com to charge the Subscription fee amount, and any applicable sales, excise or similar taxes to the payment method that you provided at the time of purchase or activation, through a suitable, secure, online payment system. The Subscription fee is inclusive of VAT within the European Union. You are responsible for correctly identifying the country from which you are purchasing the Subscription, for the purpose of payment of VAT. You may cancel your paid, non-refundable MetalMusicBookings.com Subscription at any point during your Subscription Term, however, due to the nature of the service offered, you will NOT receive a refund of the Subscription fee for any unused months of your current Subscription Term. You may not transfer your MetalMusicBookings.com Subscription, or share your MetalMusicBookings.com Subscription account with any third party. You are solely responsible for ensuring that you have the appropriate software, hardware, and Internet connection necessary to operate the MetalMusicBookings.com web browser application. You may also be required to download additional third-party software. MetalMusicBookings.com reserves the right to cease supporting any hardware or software platform at any time, with or without notice to you. By registering you agree that you understand you may cancel my non-refundable Subscription at any time by contacting MetalMusicBookings.com Support through the contact form. MetalMusicBookings.com agrees not to share your details with any third party without your prior, written consent. As an exception third-party website maintenance contractors may have access to MetalMusicBookings.com user details. Such contractors will be bound by MetalMusicBookings.com agreement not to share user details further, and will also agree only to access and use data on MetalMusicBookings.com users for purposes relating to management of this website. Metal Music Bookings.com is governed by the laws of England.